The Southeast Asian Ceramics Museum’s (Bangkok University) new newsletter is out. Download from the link below. The UCLA International Institute posts a memorial for Roxanna Brown, the director of the Southeast Asian Ceramics Museum who died in prison last week under dubious circumstances. It is with deepest sadness that we mourn the untimely death on May 14, 2008 of UCLA Art History alumna Dr. Roxanna M. Brown, 62, world-renowned expert on SEA ceramics, curator of the Southeast Asian Ceramics Museum at Bangkok University and editor of their excellent newsletter. She died in Seattle reportedly of an infection brought on by a perforated ulcer while in federal custody on a very dubious indictment. She had gone to Seattle to present a paper on SEA ceramics at a conference co-sponsored by UCLA and the University of Washington. This story from the Bangkok Post repeats most of the details already released before, but also includes some comments from Roxanna Brown’s colleagues. There’s a general feeling of shock, as well as dismay that there wasn’t an opportunity for the truth to emerge. More news on Roxanna Brown’s arrest. Bangkok University, which is home to the Southeast Asian Ceramics Museum of which Brown is the director, denies any involvement in the antiques smuggling. At the same time, they have also said that they were never given any cause to suspect anything shady. 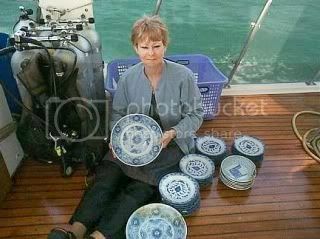 14 July 2007 (The Star) – Noted ceramics expert Dr. Roxanna Brown from the South-East Asian Ceramics Museum in Bangkok will give a lecture about Shipwreck Ceramics and the Fall of Malacca on Saturday’s meeting if the West Malaysian chapter of the South-East Asian Ceramics Society. The article also outlines how ceramic finds from shipwrecks have helped us understand key points in ancient Southeast Asia’s history. Ancient shipwrecks with Chinese, Thai and Vietnamese ceramics are important in that they can tell us how maritime trade in South-East Asia had an impact on kingdoms like Sirivijaya, Angkor, Ayutthaya and Malacca. According to Bangkok-based South-East Asian Ceramics Museums director, Dr Roxanna Brown, the ceramics offer an insight into how the maritime trade enriched these centres of development. Based on the types of ceramics found, as well as excavation sites, a chronological order of trading activities, empire development, and even the building of temples like Angkor and Borobudur can be verified, said Dr Brown who will be delivering a lecture on Shipwreck Ceramics and the Fall of Malacca at the 31st annual general meeting of the South-East Asian Ceramics Society, West Malaysia Chapter on July 21 at Muzium Negara, Kuala Lumpur. Read more about Dr Roxanna Brown.